Global BC reports, “Tina Ferrone is still trying to wrap her head around how lucky she was. The Ottawa-area woman picked up a cheque for $48 million on Tuesday after buying a Lotto Max ticket “on a whim” for the first time last week. Ferrone bought the ticket during her lunch hour on the day of the draw after seeing a commercial announcing the size of the jackpot. The next morning, Ferrone heard on the radio that the winning ticket had been sold in Ottawa. Later that day, she decided to check her ticket at a local drug store while she was out running errands. Ferrone then called her husband, telling him to join her at the store before her ticket was validated with the retailer. After that point, she said he had to be the one to communicate with the Ontario Lottery and Gaming Corp as she was in a state of shock. The mother of three who works as an events co-ordinator and is also a yoga teacher said she wanted to use the money to support her family and make one particular dream a reality. “I want to open a wellness centre, a yoga studio and just sort of dive into that 100 per cent,” she said. The couple also plan to pay off their debts, buy a new truck and travel. Her husband, who was diagnosed with cancer two years ago, said the lottery win came after what he called a “rough run” for the family. “I’ve been through chemo, stem cell transplants, surgeries. It’s been a long road, we never expected to get this,” said Liam McGee, whose cancer is now in remission. After celebrating their win, the couple said they plan to sit down and hammer out a sustainable financial plan. “We’re going to do short term and long term and everything in between,” McGee said with a laugh. 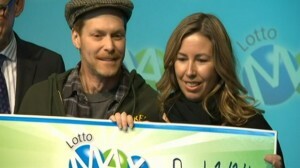 Ferrone’s winning ticket was picked in last Friday’s OLG Lotto Max draw.